Presbyphagia is a term used to describe swallowing difficulty of the sort that can be associated with the aging process: the process of swallowing as a whole is inefficient and reduced in vigor. Common findings include globally (as opposed to focally) reduced muscle bulk, often seen in vocal cords and not just pharyngeal wall musculature; globally reduced strength of contraction of the pharynx; and tendency for retention or pooling of a part of swallowed food or liquid in the vallecula or pyriform sinuses. 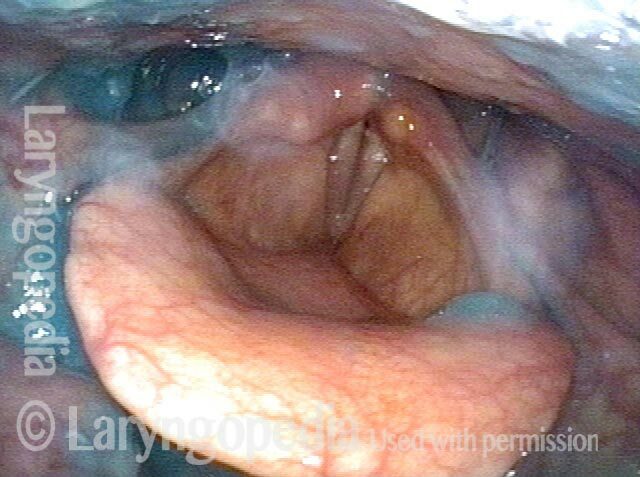 Presbyphagia may be associated with cricopharyngeal dysfunction and, when severe, aspiration. This man coughs frequently especially when drinking. While his palate elevation, pharynx squeeze, and vocal cord functions are intact (as determined during VESS part 1A), note the pooling of saliva especially in the right pyriform sinus (left of photo) and on the pharyngeal wall (arrows) as well as within the laryngeal vestibule (bottom, left arrow). This predicts that his swallowing of blue-stained applesauce, water, and cracker will also be abnormal. As predicted by the information in photo 1, after administration of blue-stained applesauce, we see here an amount and location of residue that mirrors that of the saliva in photo 1. Greater residue in the right pyriform sinus (left of photo) is often seen with right-sided pharynx weakness, but that is not the case here. After administration of cheese cracker, some of it remains in the vallecula, where it has displaced some of the applesauce. After administration of blue-stained water, most of cracker and applesauce are washed through. Some minimal blue-staining of the laryngeal vestibule explains why coughing tends to occur when drinking (especially thin liquids).